This is one for the design aficionados and for those that adore clean lines and minimal styling. 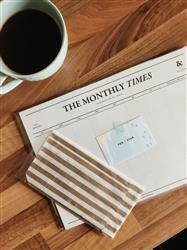 The Monthly Times desk planner by Seeso is brilliant in it's simplicity. This A4 sized organiser is designed to sit happily on your desk and remind you of all those tasks and important dates for the month. The monochrome styling of this desk calendar pad means that it's perfect as a neutral accessory for your desk and being black and white, it of course would look particularly fetching next to a bold dash of neon or colourful pattern, that's where the washi tape comes in. With 50 sheets at your disposal, this desk planner is undated, so you can use it for any month, any year, perfect! The Seeso Monthly Times desk notepad features 24 monthly planner sheets, yup, that's a whopping two years of planning right there. It also has 26 free note sheets with a dot and lined design that's perfect for keeping track of all those rogue ideas and maybe the odd doodle. Keep your month-to-view with the Seeso Monthly Times desk calendar and you'll wonder how you ever managed to get anything done on time. The perfect gift for students, this desk notepad makes an excellent study planner. It's also pretty neat for making a note of reminders in the office and keeping those deadlines and tasks to view. So happy with it! Exactly what I was looking for and the paper quality was great! Great product. I like that it is simple and adaptable to my needs. I like that plastic wallet as it keep its tidy as it’s going to be in an out of one bag and another. The large space on the right is great for my to do list. The boxes are complete adequate for the detail I require but others may benefit from more space. I work as a teacher and this simple addition to my desk, at work, is an excellent, stylish, addition to my daily planning routine. Highly recommend.